Pine sideboards offer a great alternative to people who cannot afford or who choose not to go for oak sideboards for some reason. 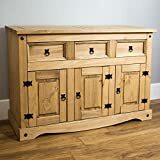 If you are looking for hardwood furniture then your first choice would and should definitely be oak but pine also has its place for those who have their own reasons to go for softwood furniture. Pine furniture have been around for several decades and perhaps, pine is the most important of tree species of commercial benefit for making furniture. There are advantages associated with pine sideboards and all kinds of sideboards in general are quite popular so a combination of both would allow you to get something that would offer you the best value for your money. Several brands of furniture have focused upon pine furniture and among them, the most popular variety are the corona range from mercers furniture. These are made from Mexican pine which is known for its quality. 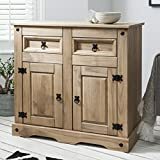 They also have their panama range however you can also find a good enough variety from different stores that choose to come up with unique and appealing designs of pine sideboards and pine furniture in general. Pine sideboards very much like oak sideboards, vary in design and style but also, they are not all made from the exact same tree type. 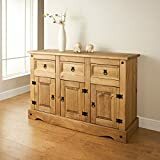 While its true that oak furniture tend to be stronger than pine, you should also appreciate the fact that solid pine furniture can equally be good. 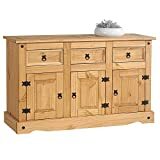 Moreover, no one subjects all types of furniture to strenuous and rough use and since sideboards are designed to stay in one place where you could be storing a range of your household items, it only makes sense that pine sideboards would not only be cheaper but good enough for your requirements. 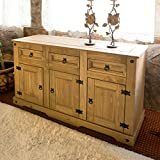 Like other items of furniture, pine sideboards are also available under different denominations and this is usually dependent upon the number of doors and drawers that they are made available in. They could have any number of doors and drawers making it important for you to pick them carefully depending upon your usage needs and storage requirements. You would need more doors for larger items and more drawers for smaller items that you need to tidily arrange so that you can find them anytime you have a need for one of your items. A big challenge for households is usually that of being able to quickly find an accessory or a utensil that they may have a quick need for and sideboards are designed for this very purpose. Once you have made your mind up on going for solid pine sideboards, the next step would be to compare different varieties available in the market and review their ratings. It is also recommended that you check which pine sideboards are proving to be bestsellers in the market so that it become easier for you to make your mind up and pick the right one that would be perfect for your needs. It is not easy to check lists of best sellers, newly introduced and highly reviewed pine furniture from your local furniture shops. The easiest way is through the internet and you can usually rely upon lists provided by popular stores who provide lists based on actually customer shopping experiences and reviews. Expedited delivery available! (In checkout - Scroll down to delivery details and select 1 day delivery).